I recently returned from a fascinating month in China. Over and over again the “Castleton Spirit” that Frank Wan wrote about in the last blog led me to extraordinary experiences. 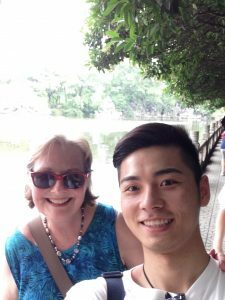 I’ve traveled in China several times over many years, but this time, thanks to the “Castleton family”, I enjoyed warm welcomes from Chinese friends who gave me deep insights into this culture I have studied and appreciated for so long. In Shanghai, my first destination, what a thrill it was, accompanied by friends of Castleton friends, to wander the streets of the old part of the city where modern history had been made, finding the historic homes of artists, writers and leaders. (Yes, I am a history nerd. And China has an awesomely long and intriguing history!) Shanghai is also futuristically modern, and I marveled at the contemporary architecture and art, subways and shopping malls. Second, Anhui Province now feels like my new home, a kind of “sister state” to Vermont. The university scholars who have spent a fall semester at Castleton the last few years live in Anhui, where I joyfully reconnected with them, met their families, and got to see a bit of this rural, green province. 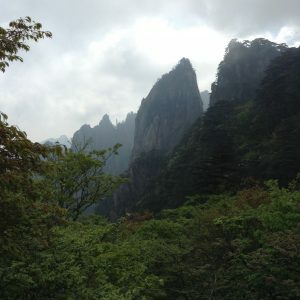 They took me on mountain hikes to historic sites dating all the way back to the Han Dynasty (roughly contemporaneous with the Roman Empire), traveled to vast bamboo forests and medieval towns preserved as UNESCO World Heritage Sites—and where Crouching Tiger, Hidden Dragon was filmed!—and to China’s iconic and stunning Huangshan mountains in Anhui’s south. Along the way, I delighted in dinners with Chinese friends, who were eager to demonstrate to me exactly why the cuisine of Anhui is esteemed as one of China’s finest. Honestly, people, Huden Dining Hall has some catching up to do! Right when homesickness struck me, I was invited to the home of a friend, where I met and fell in love with her whole family, especially Popo (my friend’s mother-in-law, my “older sister”) an amazing and lively cook, who let me film her in the kitchen. First I sat in the courtyard with father- and mother-in-law, helping to peel freshly foraged bamboo shoots from a mountain tea plantation, then got to hang out in the kitchen chatting with Popo. Mind you, all the while we are talking, she’s cooking, I’m filming her, and out the window neighborhood life in the narrow alleyway goes on, with babies learning to walk, dogs running in and out of everyone’s houses, neighbors chatting… It was a delicious meal I will remember forever, but, evermore I’ll remember how families in China took me into their hearts just when I was missing my own family so much. My final highlight was meeting Castleton undergraduate Frank Wan and his warm, supportive family in Nanchang. Just like other Castleton parents, they proudly welcomed me and Frank—home from his first year of college—and expressed appreciation for Castleton’s care and education of their accomplished son. As Frank shared the history and culture of his beautiful hometown the next day, he of course introduced me to more yummy foods. What is family without food? 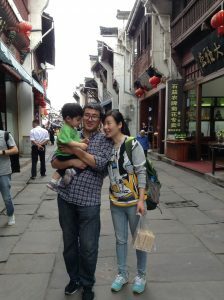 My first Chinese family, Baby Liuliu with parents William Wang Liangong and Justine Zhou Ting, former visiting Castleton Scholars, shown here in Huangshan City. Huangshan mountains in Anhui Province. With Frank Wan in Frank’s hometown of Nanchang. 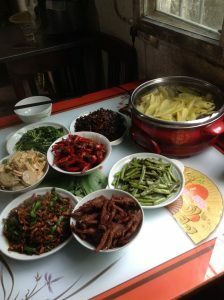 Local dishes in Anhui Province, reputed to be some of China’s finest cuisine.